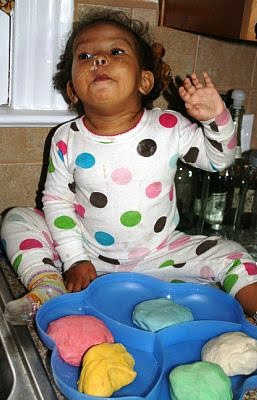 I was over at House Full of Nicholes and saw that she posted her recipe for playdough . Babygirl loves messing around with me in the kitchen, so I figured she could play with this, when we're not in the kitchen. We had to add more flour than the recipe calls for, because it was a bit too sticky at first, but it turned out great! We mixed it all up together and then added the colors. I used some standard food coloring that I wouldn't use on food, but for this, I figured it was okay. Once we were all done, I layed them all out for her on a big platter. I guess seeing all that dough layed out for her to play with was super exciting, because she said "Wow" and started clapping. Thanks for the idea and recipe Tasha! 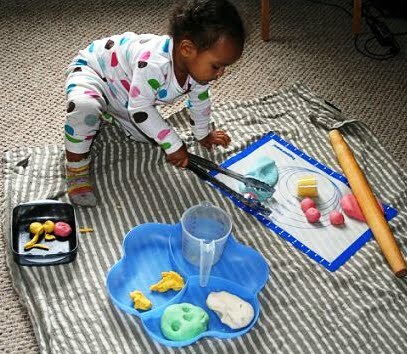 Oh I used to love when my mom made us Playdough, normally on a rainy day. 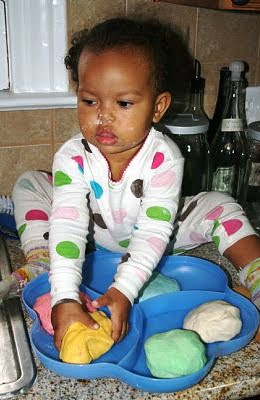 Brings back great memories :) I love her polka dot outfit!